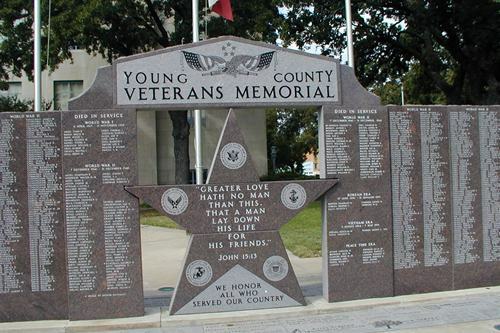 Young County Courthouse Graham Texas. A frame two-story courthouse was built in 1876 and was replaced by a three-story limestone courthouse eight years later. 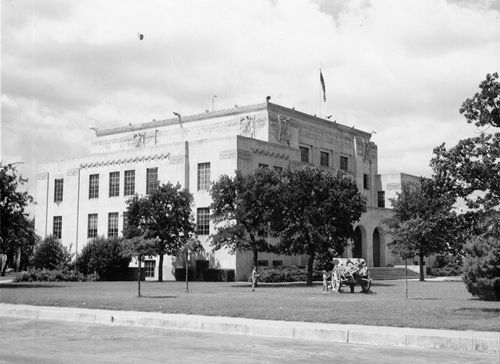 The current courthouse replaced the 1884 courthouse that was demolished in 1932. 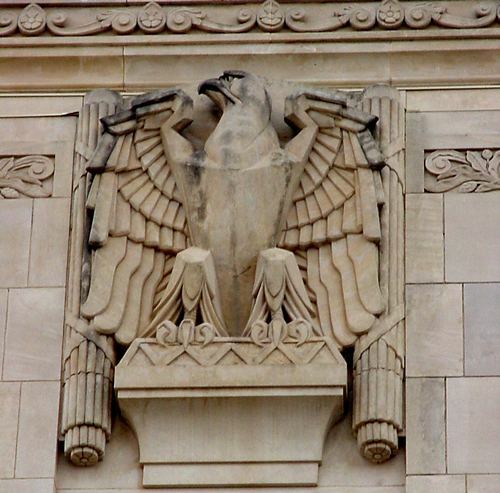 "The 1932 Young County courthouse - The architects, Withers & Thompson, also designed the Menard County courthouse in Menard. The construction materials are different in both courthouses, but the internal and external design is very similar. 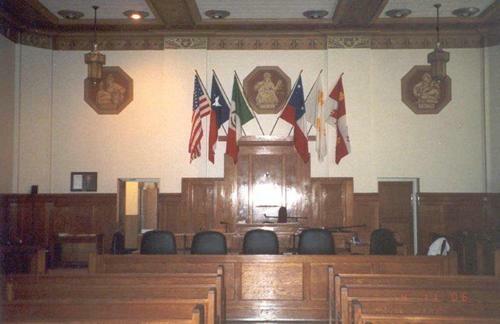 "The district courtroom. The three woman depicted above the judge's bench represent courage, justice and truth." 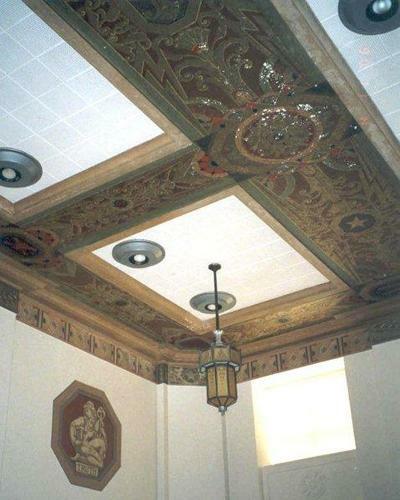 The beautifully detailed ceiling in the district courtroom. 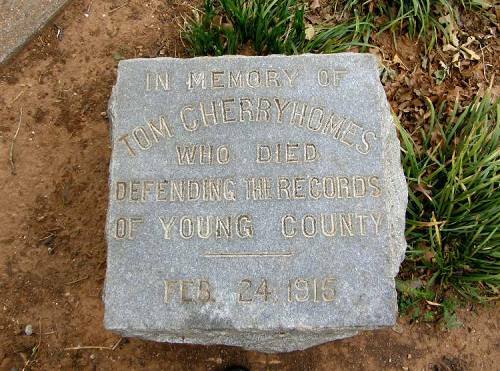 Young County was organized in 1856 with Belknap designated as county seat. 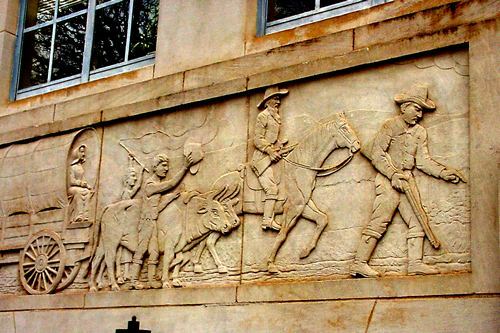 After retreat of frontier troops during Civil War, county records were moved to Jacksboro 1865 during renewed Indian trouble. 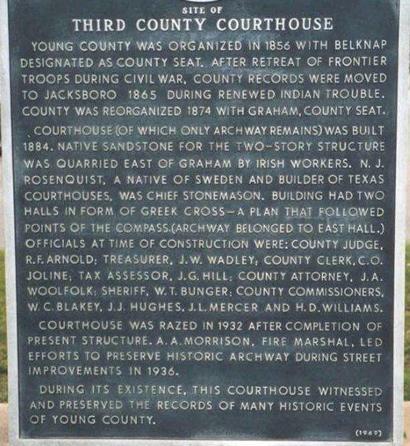 County was reorganized 1874 with Graham, county seat. Courthouse (of which only archway remains) was built 1884. 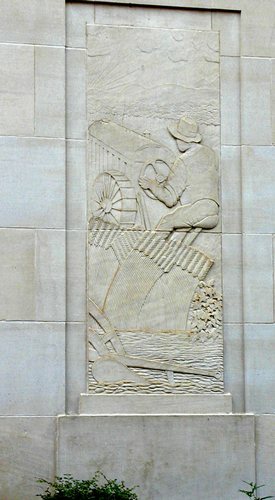 Native sandstone for the two-story structure was quarried east of Graham by Irish workers. 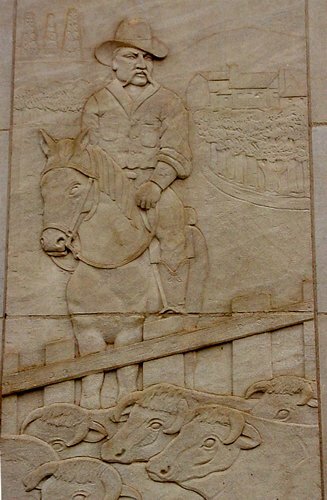 N. J. Rosenquist, a native of Sweden and builder of Texas courthouses, was chief stonemason. Building had two halls in form of Greek cross--a plan that followed points of the compass. 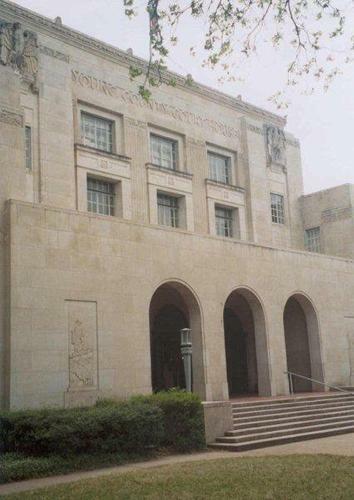 (Archway belonged to east hall.) 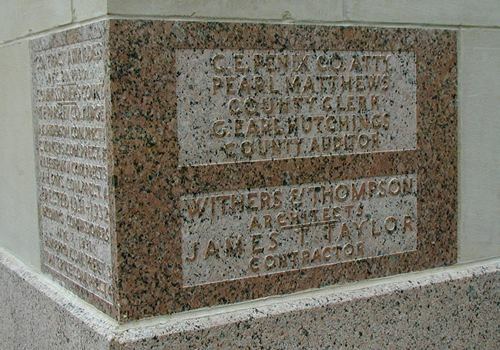 Officials at the time of construction were: County Judge, R. F.Arnold; Treasurer, J. W. Wadley; County Clerk, C. O. Joline; Tax Assessor, J. G. Hill; County Attorney, J. A. Woolfolk; Sheriff, W. T. Bunger; County Commissioners, W. C. Blakey, J. J. Hughes, J. . Mercer and H. D. Williams. 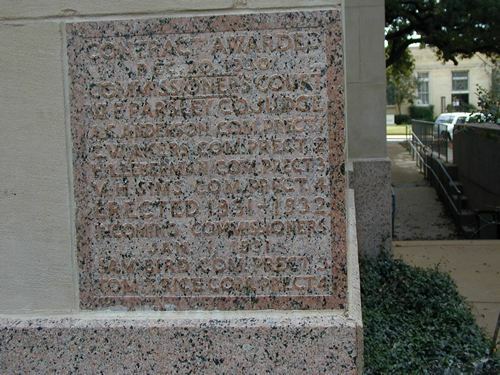 Courthouse was razed in 1932 after completion of present structure. A. 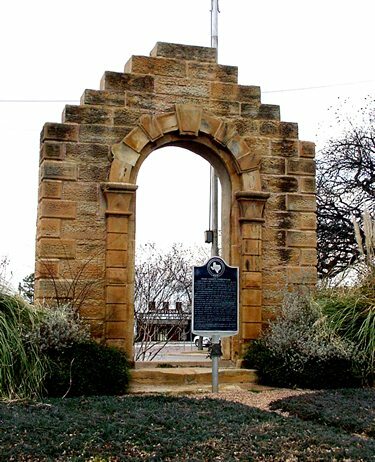 A. Morrison, fire marshal, led efforts to preserve historic archway during street improvements in 1936. 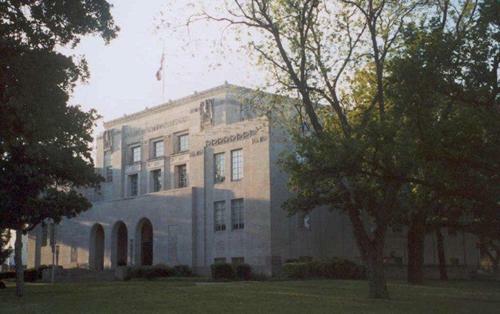 During its existence, this Courthouse witnessed and preserved the records of many historic events of Young County.